Overseeding is best done in early spring (hopefully after the last frost) or in late fall when the brunt of the summer heat has left. You will also want to make sure that you have not put down any preemergent fertilizers (pretty much any non-organic fertilizer) as almost all non-organic commercial lawn fertilizers/weed killers have chemicals in them that stop seeds from growing. Seeing as how we need our new grass seed to grow you will want to be very sure that enough time has passed for the effects of the Scott’s or whatever you use on your lawn has worn off. That’s why spring is probably your best best if you use those products. The first thing you need to do is to mow your lawn as short as your lawn mower will go. This is very important because the new grass that you are planting needs access to sun light and a fair shot at growing without your existing grass choking it out. Note your lawn will look like crap for a couple weeks. The next thing to do is to remove thatch that has built up in your lawn and work up the soil. Thatch is basically dead grass that accumulates on the top of the soil below the grass. Thatch is more of a problem with lawns who use chemical versus organic fertilizers, because in organic fertilized lawns there are many more microbes which actually love to feast on the thatch. So if you have a super healthy organic lawn thatch is a non-issue, another reason why you should consider organic lanwncare as in the long-run it actually is less maintenance. Anyway dethatching your lawn can be done 1 of two ways. Rent a dethatcher that can be pulled behind a riding lawn mower, or grab a rake and get a good workout. You will likely be surprised at how much thatch you have in your lawn. If you are too frugal to rent a dethatcher and too lazy to rake your entire lawn by hand you can just concentrate on the problem areas in your lawn (bare spots, very thin grass, etc). It is still important to make sure you work the soil a little bit so that the sees have a chance to settle in and establish themselves. The next thing to do is to buy grass seed. Here is where you can use your digression. Many people recommend that you buy the best grass seed possible as it is going to be a little more difficult for this grass to take root due to the existing grass in place. That being said it’s grass seed so I’m not exactly sure a company can make a seed grow better than the next one, it’s sort of out of their hands. Anyway you will want to make sure you don’t buy a bag of annual ryegrass or anything like that. Even though ryegrass does very well and grows very fast, if you buy the annual type you will have not accomplished anything long-term. My advice here is go ahead and get a Kentucky Bluegrass or something that does well in your region, looks very good, and hopefully matches your existing grass.. The good news with overseeding is that you are not going to use a ton of grass seed so the expense is not going to be that great. I overseeded the heck out of my entire lawn last summer and still have over half of the big bag of grass seed that I purchased. 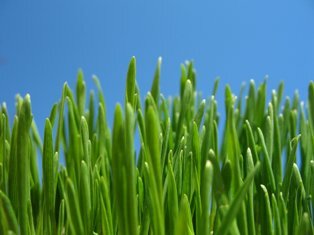 Another thing that you may want to do is go ahead and pull any weeds that may have sprouted in your lawn. I actually purchased a weed hound last summer and while it’s not perfect it gets the job done most of the time. You want to set the weeds if there are any back as far as possible that way if they do actually recover, hopefully your new grass will have taken hold in that area and will be able to drown out the weed permanently. If you have a super thick lawn, which you will if you overseed a few times, weeds become less and less of an issue because they simply don’t have a fighting chance against your super thick carpet lawn. A word of caution. By the time you get to this point your lawn will look like crap. Don’t be discouraged, it’s only temporary and within a couple weeks it will be back to normal and a month later your neighbors will be asking you what you did to your lawn because it looks so great. You can technically overseed by hand and spread the grass seed in the bare spots. Be careful that you don’t spread it too thick as if you have too many seeds in one area they will have to fight with each other over resources and may actually be weaker grass as a result of it. General rule of thumb is you don’t want more than 15-20 seeds per square inch. What I recommend though is that you use a broadcast lawn spreader and spread the seeds over the entire lawn. The advantages of using a lawn spreader are that you can do a more even job and it’s not that much work to do your entire lawn. Trust me you will want to do your entire lawn as even in the thick areas there is likely room for improvement and your entire lawn will look great. Note: if you used your lawn spreader for spreading weed killer or other chemical lawn product you will want to wash it out very thoroughly otherwise your grass seed may not grow due to the preemergent chemicals left over in the spreader. Better safe than sorry. As far as what setting to set on your spreader I’m not going to try and guess and give you a setting as every lawn spreader is different. My best advice is to pick a setting and go over a really bare spot in your lawn. Then use the rule of thumb from above that you should have about 15 seeds per square inch. If you don’t have a bear spot my advice I guess would be to go to a lower setting as you can always store the left over grass seed and use it again in the fall or again next spring. After seeding it wouldn’t hurt to take another pass over the lawn with the dethatcher or rake just to work the soil a little bit, although I didn’t do this last spring and still had great results. The only other thing you really need to do is make sure this new grass gets enough water. Hopefully a rainstorm or two is in the forecast, but if not you will probably want to water the grass immediately after overseeding, and then it’s up to you as far as what you think of spending money to water your lawn. I probably watered 15 minutes a night for 3 or 4 nights in the first week and then after that I sort of let mother nature take over. Obviously if you live in a very dry climate you will probably want to do more watering. Just use your own judgment here and make sure your lawn has enough moisture to support these new seedlings. Now it’s time to just sit back and watch as your lawn transforms itself into a super thick green masterpiece. Overseeding is something that can and probably should be done a few times, but honestly after the first time you should see very very noticeable results.